On September 11, 2001, Give Back Yoga co-founder Beryl Bender Birch was living in New York City, where she taught yoga to athletes. Two days after terrorists attacked the Twin Towers, her friend JoAnn Difede — director of a program that studied anxiety and stress — asked Beryl to come to her offices to help the families of burn victims who had escaped from the towers. That moment would shape the course of her career, as Beryl began using yoga practices to help first responders and those with post-traumatic stress. Later, the medical community would realize just how helpful the broad spectrum of mindful yoga therapies could be when used as a complementary treatment for anxiety disorders and post-traumatic stress. Thanks to JoAnn’s urgent call for help after 9/11, Beryl was able to help lead the way, becoming one of the first yoga professionals to apply yoga methodology to the integral treatment of post-traumatic stress. On this 14th anniversary of 9/11, we honor the memory of this tragedy and our hope for the future with an excerpt from the preface to “Yoga For Warriors: a System For Veterans & Military Service Men And Women,” written by Beryl and published by Sounds True. “When I walked into a small room in the hospital burn center, I was nervous. It was filled with comfortable couches and chairs, a plain wooden table, and just a few men and women — relatives of the people who were wrapped in bandages from head to toe and heavily medicated for relief from unbelievable pain. Many were dying, others struggling for life. Their family members sat in stunned silence. They all looked up as I came into the room, hoping for news of someone, somewhere. They looked exhausted. No one had slept since the towers collapsed. I didn’t assume anything. I didn’t assume I could help. I didn’t assume I knew anything that could be of use. Faced with such incredible suffering, how could anyone go on with the mundane activities of life? There was such a sense of despair in the room. I just sat down quietly at the table and put my head in my hands. Dear Lord, I thought, give me strength and the right words to say. A man came over and put his hand on my shoulder. We both started to cry. That was it — the icebreaker. I introduced myself and suggested that we, all together, see if there was something we could discover, something we could do, that would help us all to sleep, to deal with the tragedy, to grieve while avoiding despair and depression. I remembered what I had done in yoga classes the night before: sitting with everyone and breathing. It was the breathing that seemed to offer the most relief and the most comfort. ‘Let’s just sit together,’ I suggested. Everyone moved into a circle around the table, and I invited them to close their eyes. What happened after that, I don’t remember very well, except that I slowly came around to teaching them a closed-mouth yoga breathing technique called ujjayi. Breathe in, breathe out — with sound. That’s all. You just pay attention to the sound and see if you can make the inhalation and the exhalation the same length and make them sound as much alike as possible. Within minutes, everyone at the table was making the slow, controlled, aspirant sound of the inhalation and the deep, sibilant sound of the exhalation. They just got it. They hung on it as a lifeline. Time became timeless. We sat like that for nearly thirty or forty minutes, although none of us had a clue how long we had been there. I kept an eye on them. Each of them just climbed into the breath and went to a place that was quiet and peaceful — for a moment. One man fell asleep during the session; God bless him. It was joyful to see him sleeping. Another woman actually smiled and came and hugged me. I can’t say it was some miraculous cure for suffering, but it did help. 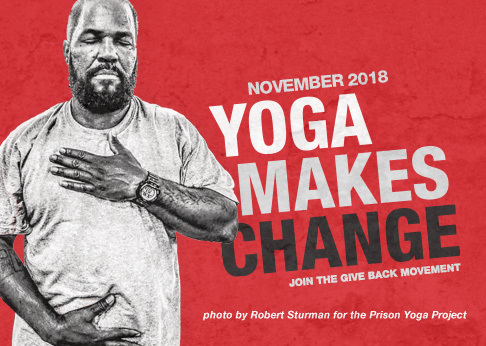 Learn how you can share “Yoga For Warriors” with those who have served.